I have a thing for French skincare brands. They seem to always manage to provide efficacy with innovative products tailored to specific areas and actually deliver results without over hyping their brand. Brands I’ve fallen for include Payot, Nuxe, Biotherm, Darphin and now, Decleor. 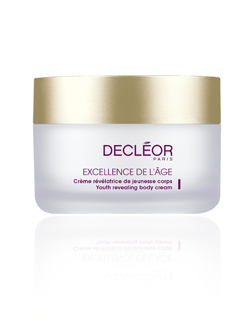 Decleor’s new releases (the Excellance de L’Age range) are specifically aimed at body ageing (no comments, please..) and make the point that although less exposed to environmental actors than the face, your body goes through significant hormonal changes through ageing as well as decline in muscle mass when the skin eventually begins to sag. Areas particularly affected are those where skin is thinnest such as the back of arms and inner thighs, so daily maintenance is needed to keep skin soft and supple by applying a product with not only collagen and elastin. 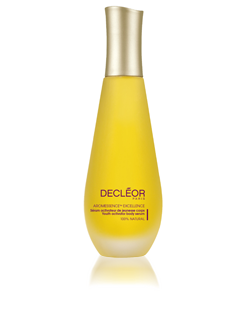 Decleor’s two new products, Aromessence Excellence Youth Activator Body Serum and Youth Revealing Body Cream attempt to do this and, despite the long convoluted names, are easy to use and smell gorgeous as well as delivering on results by up to a 93% in firmness according to studies on a focus group. Both products seductively include frankincense, immortelle (which stimulates collagen) and roman camomile. I tried the body cream although I must admit, I find constant lathering on of body cream product irksome and ‘just another thing to do’ in the bathing routine. This one with it’s star active ingredient, Manikara extract, dried in quickly with a silky after texture and also smelled nice but it’s only making way for the amazingly seductive body serum with its silky quick dry oil that’s a pleasure to apply and has quickly become a ‘quick squirt’ staple to the bathing routine. It brings to mind being massaged with luxurious oils in a spendy spa. Next post: Selfridges Launches The Film Project with FashArt party.